As a tech integrator, I teach 320 students in grades K­­–5. In addition to pushing into each home room for Tech class, I see the special-ed population as a separate and supplemental class of nine. This class includes students with autism as well as those in Life Skills in grades 3–5. Typing can be a challenge with these students. As a function of their disability, some of my special-ed kids have difficulty remembering where the letters are on the keyboard, even from moment to moment. I used Dance Mat Typing for years, and it sufficed as a self-paced method. But it is dated and slow-paced. I recently started using TypeTastic, which looks and sounds more like the games my students play in other apps. Students find it challenging and are generally successful. When I introduced TypeTastic, I was able to differentiate instruction for the range of students in my special-ed class because the app is self-directed and students work at their own pace. Once students completed the first three levels, I switched them from tablets to laptops and introduced the idea of the home row. I have had very good success with it, and the kids are trying to maintain proper finger placement. One 5th-grade student, Lila, has particular difficulty with fine motor skills. She is unable to curl her fingers to place them on the “home row” keys. Once she saw the game that shows a graphic of fingers on keys, she placed the straightened fingers of her right hand and began to “pop” the letter balloons on the screen. Although she will never be a fluent typist, her success rate has improved and she is determined to use the left hand in the same way. Nick is a 4th-grade student with significant memory and retention skills. After playing the first six games multiple times on an iPad, he switched to a laptop. He struggled with finger placement, and even though the activity only used his right hand, he couldn’t remember which key was under each of his four fingers. Nick became frustrated with his poor results. We worked on using the onscreen finger-placement graphic, and I stood behind him, telling him which finger to use with each balloon that was released. He found that he couldn’t use his ring finger to type and began to assist that finger by tapping it with his left hand. This helped him feel more successful. Eventually, I stopped coaching and he continued. He has used the program over several days and the repetition has helped. Without the laptop in front of him, he can now remember the keys he used with his right hand (jkl;), something he never hesitates to prove. Playing these games on tablets and laptops not only improves my special-ed students’ physical skills; it also gives them a powerful sense of accomplishment when they work through a level of a game the correct way. Jan Smith is an instructional technology specialist at Elizabeth Forward School District in Pennsylvania. She can be reached at jsmith@efsd.net. 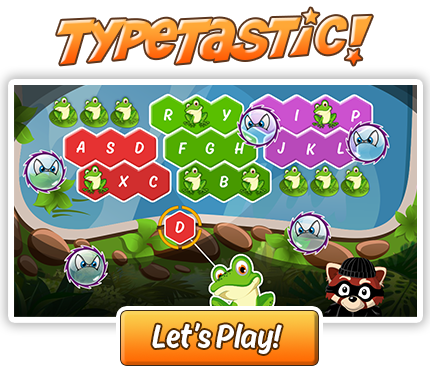 ← TypeTastic School Edition Brings Joy of Typing to All Grade Levels! Hi Linda! Thank you for your suggestion! Adding voice-overs is certainly on our list of requested features. I did the free trial of typetastic with a student with cerebral palsy. Right hand “home row “went great, when i moved to the left hand, level one wanted you to type two letters at a time, like level two did with the right hand. It was too fast for just learning the keyboard. I do not know if the full version grades the lessons into more appropriate steps, b cause the typing program isnt usable in the format of the free version. A little background, he is 8 and has been using a keyboard since he was five… Still too quick with advancement on level ONE..